Ten years ago, a group of friends known as the Sock Mob began hitting the streets of London armed with socks, sandwiches and thermos flasks of tea to hand out to the homeless. 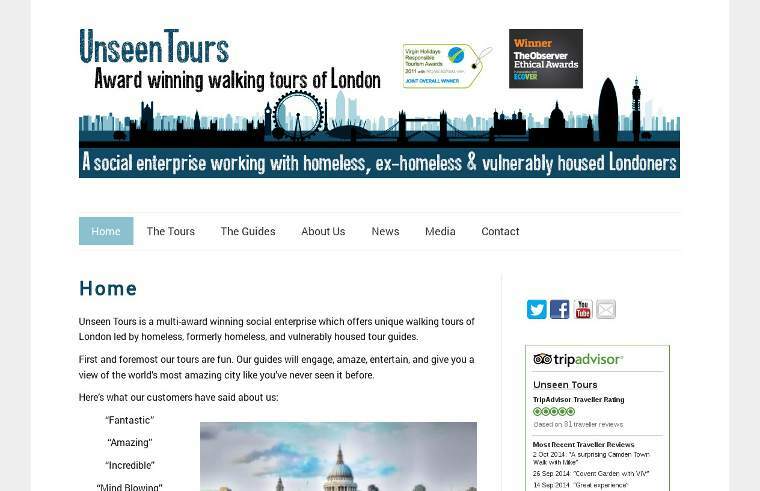 Little did they know that within seven years they would be running Unseen Tours, a social enterprise offering tourists and locals an alternative to commercial walking tours. By spending time with the homeless and listening to their stories, Unseen Tours co-directors Lidija Mavra and Faye Shields realized the potential for something great: their new friends had “specialist knowledge” of the city, so they decided to use that knowledge to change people’s perceptions of homelessness. The Sock Mob team coached the guides and the first tours were in Covent Garden and Shoreditch. They have since added other routes to their portfolio. The guides offer historical, unexplored glimpses of the city “as perceived through the lens of homelessness” while interweaving their own experiences, introducing a new social consciousness into walking tours. Shields believes the social impact of Unseen Tours is twofold. “Quite often people have never actually met someone who is homeless,” she says. As clients’ perceptions are challenged through the tour, their views “completely change: they realize the guides are knowledgeable and empowered. Not victims.” The guides themselves go through incredible change: their job boosts confidence, and they make some much-needed money from the 60% cut of ticket sales, all the while knowing they have the support of Shields, Mavra and the team. Unseen Tours is keen to expand nationally but does not have the capacity to roll it out. Let us support them.